No matter what their age, your children can start meditating. I know this may seem impossible, especially when you can’t get them to sit still for five minutes while you brush their hair, but teaching medi-tation will help them with everything from controlling their emotions, to helping them focus. Meditation is wonderful for brain development and has even been shown to have very positive effects on children with ADHD. In fact, in one study, 50% of the participants either reduced their ADHD medication or stopped taking it altogether. 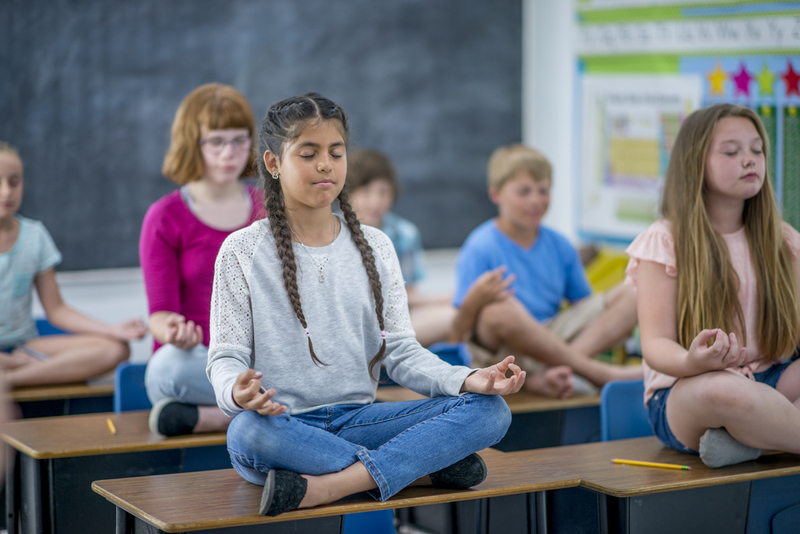 Meditation also improves higher cognitive functions so your child will be happier, healthier and smarter too! Mindful meditation can actually alter the brain’s structure and neural patterns. A recent study showed a thickening if the cortical region which controls attention and sensory processing thanks to meditation and that meditation may offset cortical thinning that results from aging. Millions of Canadians suffer from high stress levels and have no effective way of coping with their stress. Although the Japanese have known that meditation can be a great stress reliever for centuries, the practice of mindful meditation actually entered the Western mainstream through what is called mindfulness-based stress reduction, or MSBR. Although the idea of practicing secular meditation can be traced back to the work of Jon Kabat-Zinn beginning in 1979, studies confirm that mindful meditation can effectively reduce stress levels. In one such study, researchers concluded that mindful meditation reduced activity in participants’ amygdalas—the stress centre of the brain—following eight weeks in a meditation course. Set aside some time every day to meditate, even if it’s just for ten minutes. Talk about how wonderful meditation is and how it helps you in your life so that your child understands that it’s a positive thing. Allow your child to create a special space for their meditations. Discuss the fact that it must be com-fortable and free from distraction, technology, siblings and family pets. Allow them to decorate the space as they see fit—pillow forts are perfect! Start with a two or three-minute meditation. Getting off to a positive start will help to encourage them to try again tomorrow. Talk them through each meditation in the beginning. Start by getting them to focus on their breathing and to think about how their bodies feel. You can have fun with breathing here by trying different breathing exercises and techniques. Focusing on breathing is the best way to keep your mind from straying during meditation. Our minds do stray and we all need help to keep them focused. Guided meditations work well here and one technique is to learn to separate yourself from your thoughts. When you do this, you are able to let them go rather than following them down into the rabbit hole of your mind. For every successful meditation, give your child a reward they really want. Positive reinforcement and encouragement are the way to motivate here. You can meditate with your children or your whole family every day for a calmer, smarter household.